COMMENTS: On I-40 about 30 miles east of Flagstaff - has its own exit. 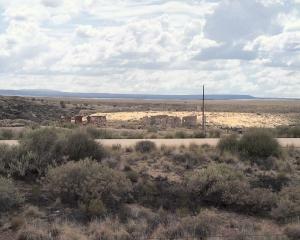 REMAINS: Extensive ruins of 20th centure commercial enterprises, 19th century old national highway and some Indian ruins. UPDATE:We visited 2 guns about the 16th of July, 2008. All the gates were down, the caretaker's Mobile Home is deserted and stripped. We had complete access. Someone has crashed into the bridge, and it is looking a little scary. Much is still the way your pictures show. A little more graffiti on the towers and the old resort. A shame about the graffiti, but still worth the stop. UPDATE: Hello! I just spent a couple of hours in Two Guns, Arizona and wanted to send you an update. The site is completely abandoned; no caretaker, no nobody. The barbed-wire fences have open gates so all of the old and newer buildings are accessible. Tons of graffiti on the newer (20th century) buildings and lots of heavy vandalism. The old stone buildings are intact and, from what I saw, unmolested. I loved the place: no safety railings, no park rangers, no concession stand, etc. 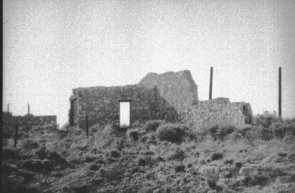 - John R. S.
Two Guns was, in the past, the site of a major confrontation between the Navajos and the Apaches in the 19th century. 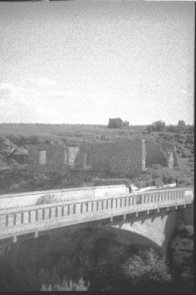 Its modern history begins when the site is recognized as an easy place to cross Canyon Diablo--first, by wagon, and then later by motor cars. 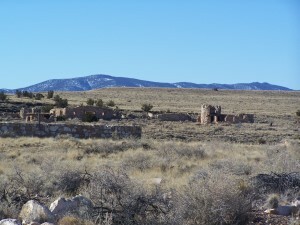 It was originally called "Canyon Lodge" when the National Trail Highway moved westward; when the Trail was re-named Route 66, the site's name was changed to Two Guns, because the proprietor of the facilities located there was one Henry E. Miller, who called himself "Two Gun Miller" (for reasons unknown). 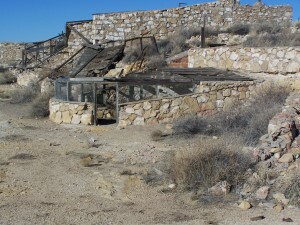 During the heyday of Route 66, Two Guns became one of the numerous tourist traps along the way, with a gas station, overnighting accommodations, a food emporium, etc., as well as the zoo (signs of which are still visible from the Interstate). 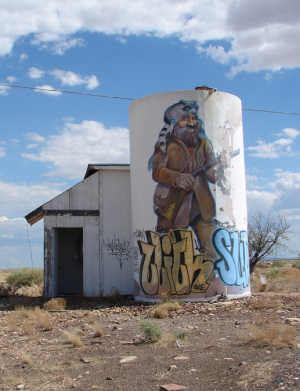 Two Guns went into decline with the building of Interstate 40; although numerous resuscitations have been attempted (including by the owner of The Main Event, in Quartzsite), it is today fenced off and not accessible to the general public. 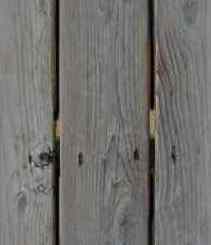 (There is a caretaker who is quite vociferous about keeping people away in order to make certain that what is left is not vandalized or stolen.) 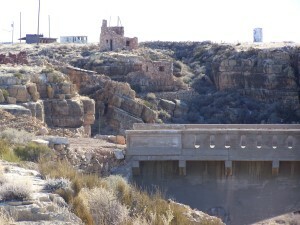 Remains: The old bridge across Canyon Diablo which was a part of the National Trail and Route 66 is still standing; there are also numerous ruins associated with the zoo, as well as the remnants of buildings associated with various eras of Two Guns's past. 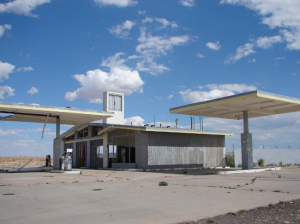 There are also the abandoned (modern) gas station and the camp grounds buildings, both visible from the Interstate. Lettery from Unke Perry who used to live at Two Guns describing the site: Dear Irene, I was happy to get a letter from you and that you and Mildred are ok and doing fine. Irene, I tried to draw you a diagram, maybe it will give you some sort of an idea of the lay of the land around Uncle Bill's old horse camp. As Cap showed me the place Cap worked for Uncle Bill for quite some time I think. He had a lot of funny tails to tell me about he and Uncle Bill. 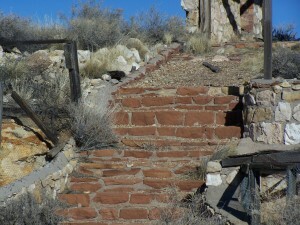 Now this old house is a rockhouse part of it has fell down there was the front room still standing when we were there. Cap pointed out to me where the trail leads out to for them to get a bucket of water. 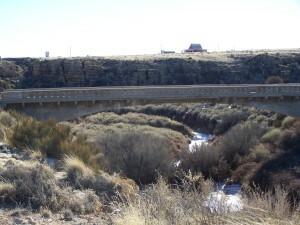 They had to go clear down to the bottom of Canyon Diablo to get a bucket of water you will see the little draw or canyon like leading down near the cabon to the north east. Now this was only the old horse ranch. 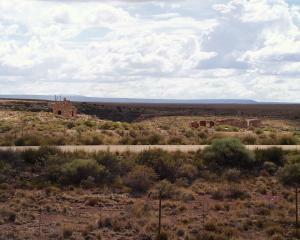 The main ranch was somwhere over on the Little Colorado River. 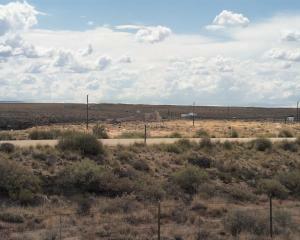 I wouldnt have any idea where it was only Cap said it was about 50 miles from the ranch to Holbrook. It would be west of Holbrook. 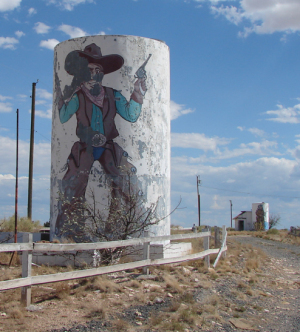 Now all that country around the old horse ranch and around the old meter crater country and on south to the rim of the Mogolon Mountains was uncle Bill's cow range. And of course north to the Little Colorado River. He sure had a large range. Uncle Bill told me that the country around there used to be the best grass country in the world for cattle. Grammer and Buffalo grass. Cattle was always fat. Now the main ranch over on the Little Colorado River was where Grandpa Roden lived and raised up his children there and when Grandpa Roden died he left the ranch and horses to Uncle Bill and the cattle was to be devided up between the girls so Uncle Bill established the range around where his old horse camp was as his own range and he branded his cattle and horses pitchfork and the girls all had a brand of their own. My mother's cattle was branded APL I dont know what the other girls branded theirs. When my dad and mother were married they sold the APL cattle to my Uncle Charlie Chapman and my dad and mom went to Oklahoma for a while took up a claim and bought some more cattle that was branded (cross ell) We later drove them west as you all know . Drove them to Santa Rosa New Mex then later on to Arizona. Well thats about all there is to it Irene except when my mom saw that she had some cattle to look after she decited she needed a cowboy. So my dad was a young gay cowboy and he was the boss of the West End range for the Hash Knife Cattle Co. Headquarters Ranch at Holbrook. So one night at a dance in Holbrook my mom spied that gay young cavallero boss of the Hash Knife Cattle Co. range so she set her cap for him and he fell like a ton of brick. That was my lucky day or else I wouldnt be here now. Well Irene I will have to go now. I will say by by for now give my love to mildred and I cincerialy do wish for you and Mildred the very best of good health and many many good blessings With Love, Unke Perry.